Questions asked by many R07 regulation students. Sample PC screenshot is available in the below link. image is re-sized , Just click on it for the orginal resolution. JNTUH : No need to apply if u had cleared all the subjects from 1 to 4 years. But if you are leaving any 1 or 2 subjects then u need to submit undertaking form so that JNTUH can issue the CMM,PC. Leaving of 2 subjects rule is discussed in coming question. JNTUH : Tatkal process is not available. JNTUK & JNTUA : Yes u can apply in Tatkal Process (It May Take 1 or 2 working days to issue the memo's). Q) Can B.Tech R07 Lateral Entry Students leave 2 subjects under the exception of 2 subjects ?Ans : Yes they can. Ans : For JNTU-HYD & JNTUA students In the PC,CMM there will not be any indication of Fail. But on the concerned semester marks memo "Fail" will be indicated. But star mark will be given for those 1 or 2 subjects in which u had failed. For JNTU-KAKINADA students In the PC there will not be any indication of Fail. But on the concerned semester marks memo "Fail" will be indicated and also on Consolidated Marks Memo (CMM) "Fail" will appear for those one/two subjects. if any other website people copy the above posted content do mention source as www.jntuworld.com as we should a credit to them for getting this information to us. If u still have any more quires do reply to the posting we will try to clarify them by giving the best possible solution. sir i am the student of jntu k ro7 i had a backlog of 1st year subject except that i passed in all.so is there possibility to leave the subject pls adress my query sir..
How can i apply for OD in online for JNTU Kakinada, i am 2010 pass out batch? is there jumbling system for up coming drawing exam ? i dont know 3-2 and 4-1 marks.. how could i know those marks in online..
what will be displayed on the certificate if i leave those two subjects(will it be displayed blank or star mark or fail)??? am i eligible to apply for jobs after leaving those two subjects with that certificate??? sir i completed my b.tech in 2012. i have a backlog of 2-1 subject(1) still. which i have attempted 4 times & couldn't pass it. i want to leave the subject in the exemption rule. if i leave that does my 4 attempts to pass it will be/will not be considered in total backlog list?am planning my MS abroad so if they will be considered as backlogs i will have 12 backlogs(attempts), but if they are not it will be reduced. please reply sir. I am 2012 passout for JNTUH and I registered online for OD. 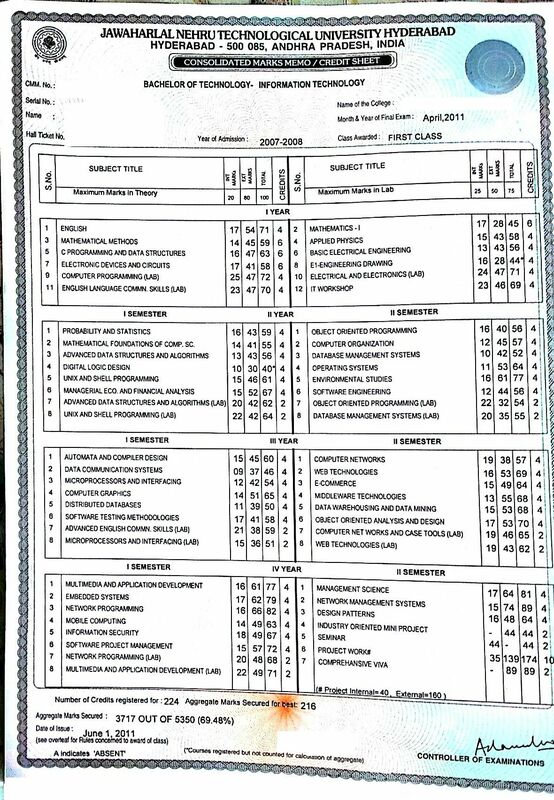 can i edit the form.. bcz i entered wrngly my DOB...plzz reply fastlyyy frnds..
sir, i belong to r07 regulation , mechanical branch.. ii hav 1baklog classical mechanix.. can i leave dat subjct ? plz do let me knw? 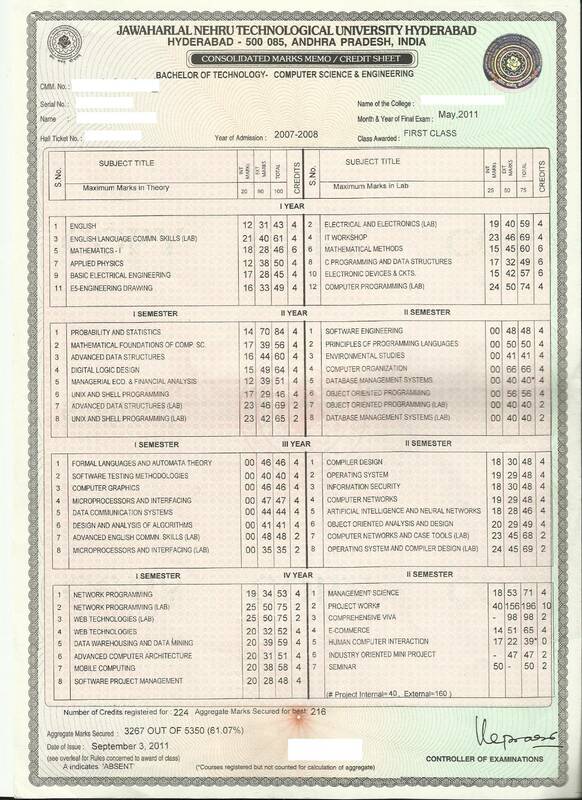 Within how many years after four years of engg can a student of R07 batch clear his/her exams? i have a doubt about the excemption of subjects that how jntuh will excempt that subjects depending on the least score.from the semister or as they wish.